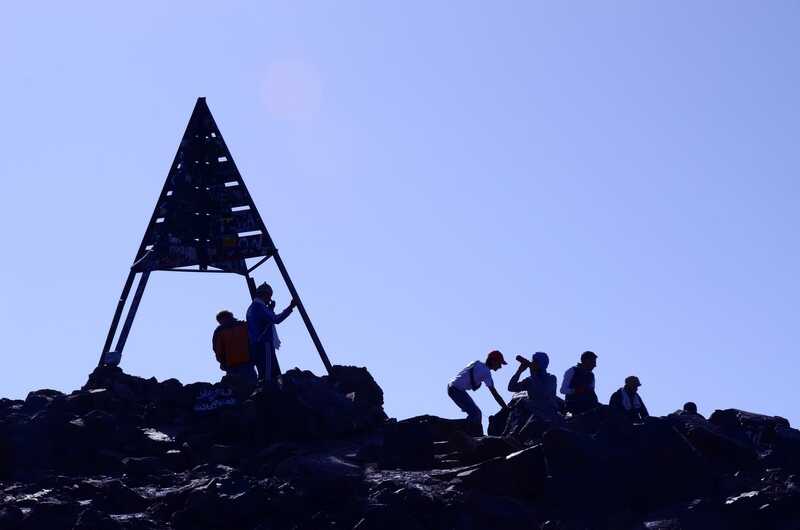 Even if you are short of time during your stay in Morocco, you can climb up mount toubkal in two days from Marrakech. The starting point of the Trek which imlil valley is very closer from Marrakech city. It 65km away from Marrakech, it will take around 1h30 drive. Once you get to Imlil, you will start walking towards Toubkal basecamp where you will be supposed to spend the night at one of the two refuges there. Then, the next day you clmb up to the top of Mt Toubkal. On the first day, it usually takes around 5 to 6hours walking. Whereas on the second day, it is going to be a longer day, it takes between 10 to 12h walk. Day one: Marrakech – Imlil – Toubkal Refuge. n the early morning, short transfer to Imlil where we meet the team. We start our hike with a beautiful climb to the village of Aremd, terraced crops, irrigation canals, then up to Sidi Chemharouch shrine, to reach the Toubkal refuge at 3207m. 5 to 6 hours of walking. Night in a refuge. Day two: Refuge – Toubkal summit -Refuge – Imlil – Marrakech. The ascent to the summit, on a good trail and good tracks, presents no difficulty, except altitude. The trail goes up a small valley and leads to the wide ridge that leads to the summit. From here you dominate a large part of the Atlas, the plains of Haouz to the north, the Ifni lake to the south, and an endless horizon towards Ouarzazate and the desert. The descent is made by the same route and, from the refuge, after lunch, return to Imlil. The driver is waiting in the village to return to Marrakech and drop you at your accommodation late afternoon. If you are interested in joining our two days toubkal trek, feel free to contact us.